An accent wall is needed within a boring room to give them some extraordinary touch. It can also break up a large room. Or, an accent wall can simply define a strong feature in the room. 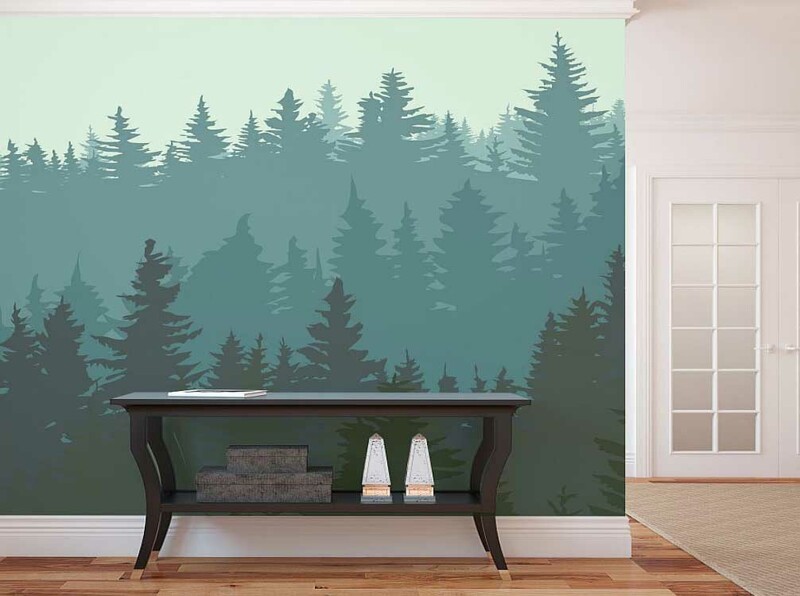 In today’s article of accent wall ideas, you will get to know how this particular side of the room does the wonder to each space. Now, please take a comfortable sit and lean back. It’s time to find out the ideas. Check them out. The wall where the bed head leans on mostly becomes a feature inside a bedroom almost automatically. 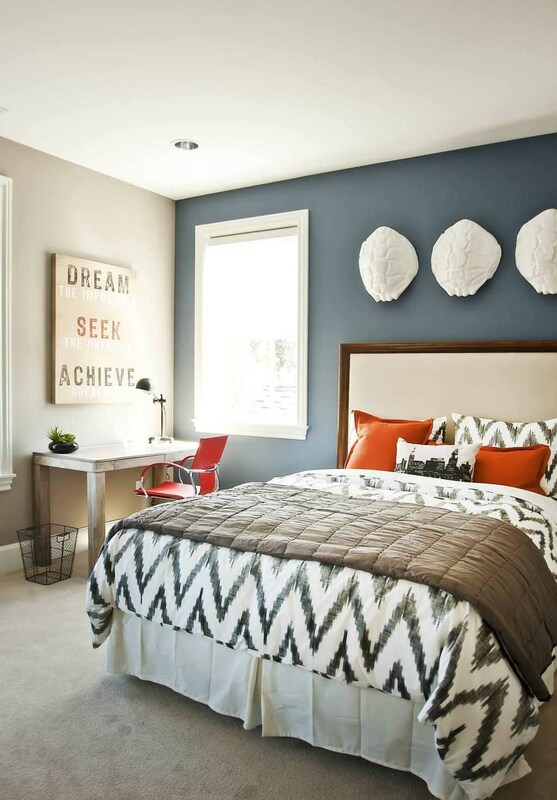 For a bedroom that works double as a study room also, you need to make the accent wall as mood booster using color in the opposite tone of the main shade. It will be such a fun idea. In this bedroom case, brown and beige shades are mostly seen. So, a dark grey accent wall is perfect to be the complete opposite tone. Attach some wall art on the wall like those big white turtle shells over there. To complete the whole scheme, add some elements in bright color, such as red chair and orange cushions. This baby room is already cute as it is. 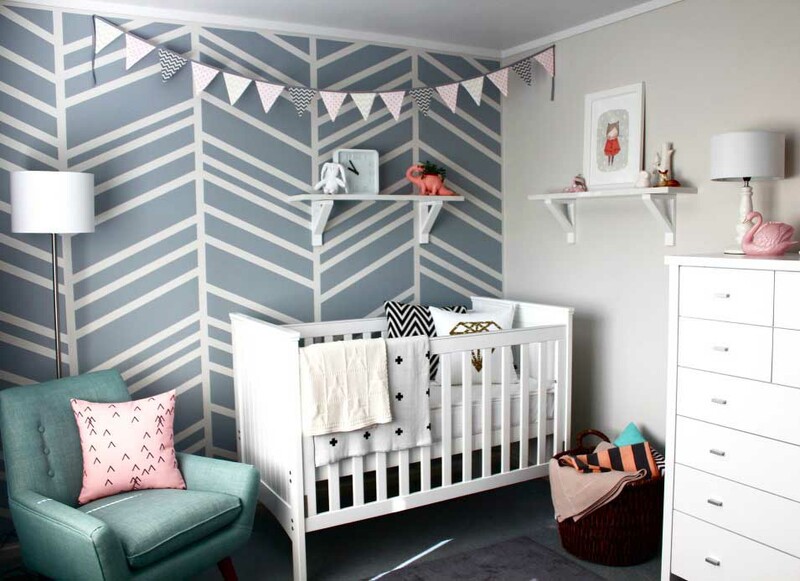 And a patterned accent wall behind the baby crib emphasizes the cuteness. If you take a look at it closer, you will know that the geometric pattern doesn’t come from wallpaper. You can actually create the exact same if not better using paint and painter’s tape. Yup! The good news is, this pattern and method fits almost every room, from kids’ to family’s, from laundry’s to work’s. An absolute benefit you can enjoy from the clever idea is the outcome of cool and fun space. 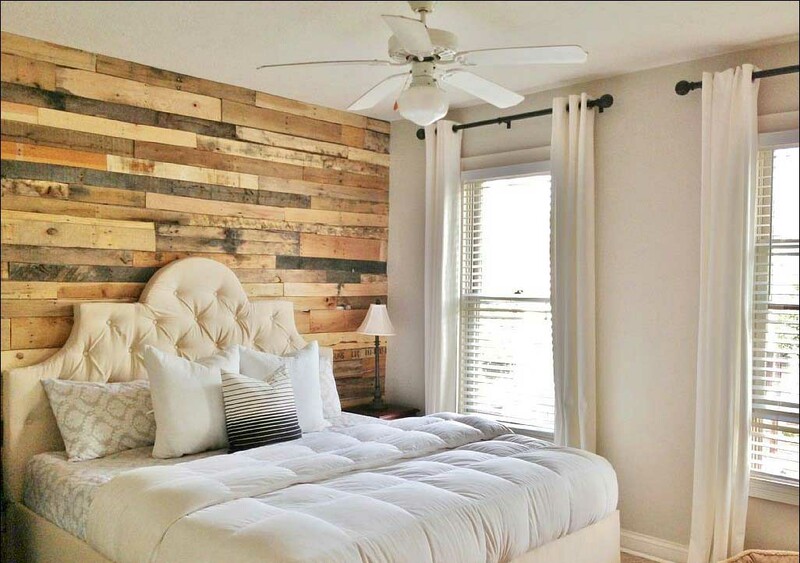 In a boring white bedroom, a definite touch of reclaimed wood planks on the accent wall is indeed required. This accent wall type is one of a kind. It creates rustic décor and adds visual interest. It also spreads warmth and gives the room some character to define. 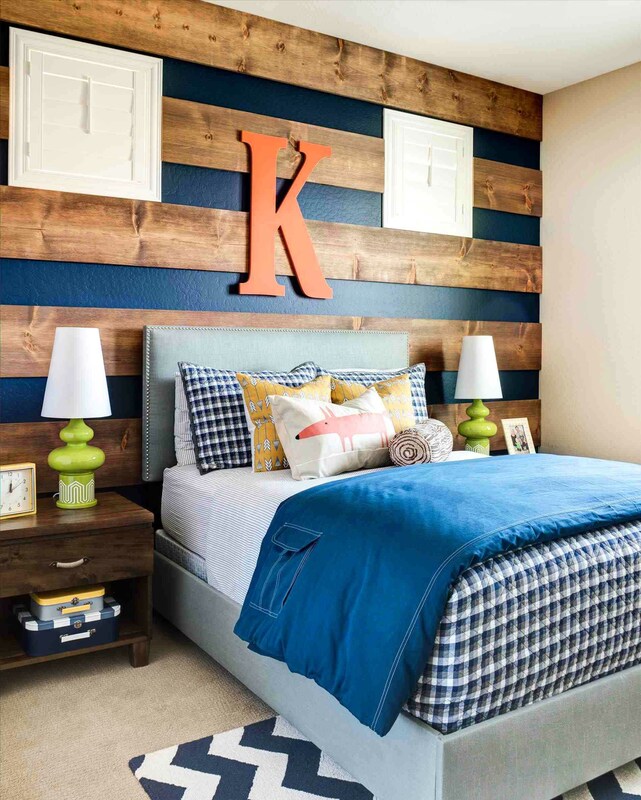 If you want an immediate result from your bedroom accent wall, using wood pallet is recommended. Accent walls not only appear in rooms, they also feature in between stories as seen in this picture. 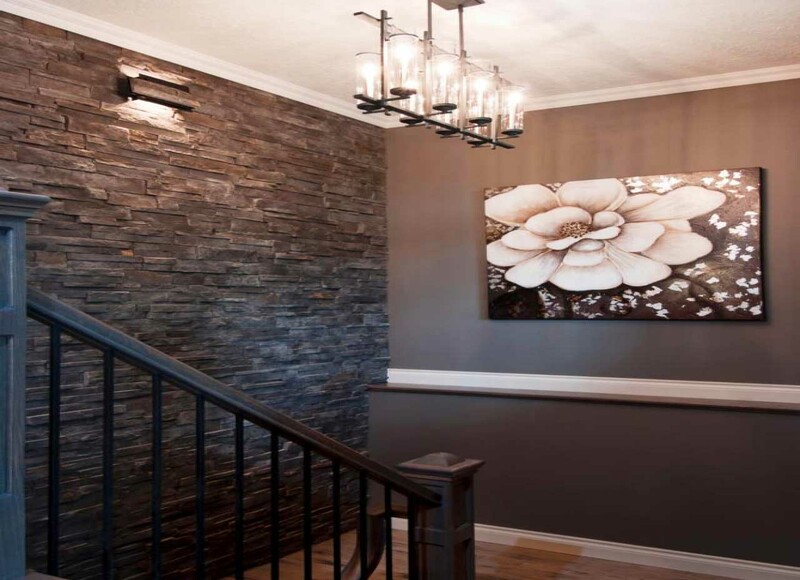 This particular accent wall utilizes faux stone that gives calming effect and sophisticated look. It’s almost impossible to fail when you involve natural materials as home décor. The final result provokes no comment but wow, doesn’t it? As for the wall choice that effectively goes with flat cut stones, tall and narrow one is the fittest among any other types. A way-too-large room needs to be broken up by an accent wall to reduce the effect of emptiness. And for the matter, a mural wall is highly likely the best fit. An example of murals forest is given here. It is seen to be the most suitable theme for a monotonous white room since it gives character and full of charm. However, the mural scene selection is up to you. You are the one who knows what the room needs and what goes best with it, after all. This is your third example of headboard accent wall. But different from the previous two, this one has the look of luxury thanks to the combination of flat, highly glossy paint and a stencil. 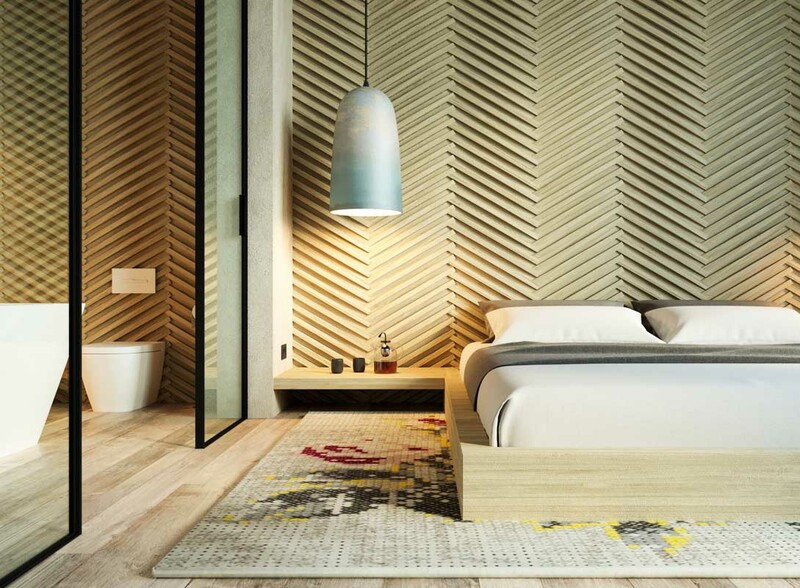 Because of its impact and subtlety, this type of accent wall is the perfect fit for master bedroom which needs minimalist and modern décor within it. The upside of this type is since it uses paint, you can easily change the design and pattern anytime you feel bored with this one without extra effort. It is also not expensive. A focal feature in the living room turns the wall behind it into an accent one. 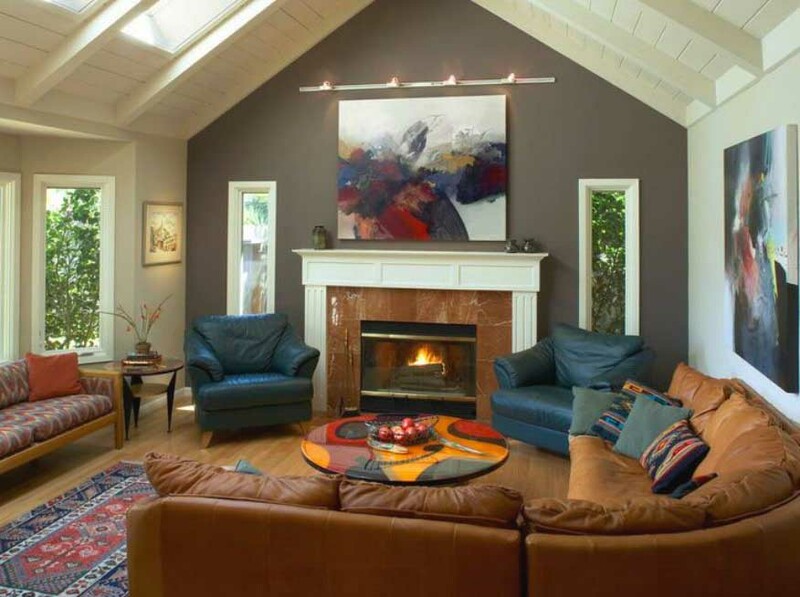 Take fireplace as an example like the one in the picture. The wall behind the fireplace is actually a regular one until it’s applied with different paint color from the walls beside it. Deep brown is perfect for an accent wall to introduce itself. What also support the action are the different lighting layouts. Such different treatments transform the actual regular wall into the main attraction of the whole space. And that what makes you think that the accent wall is some kind of the focal feature extension. 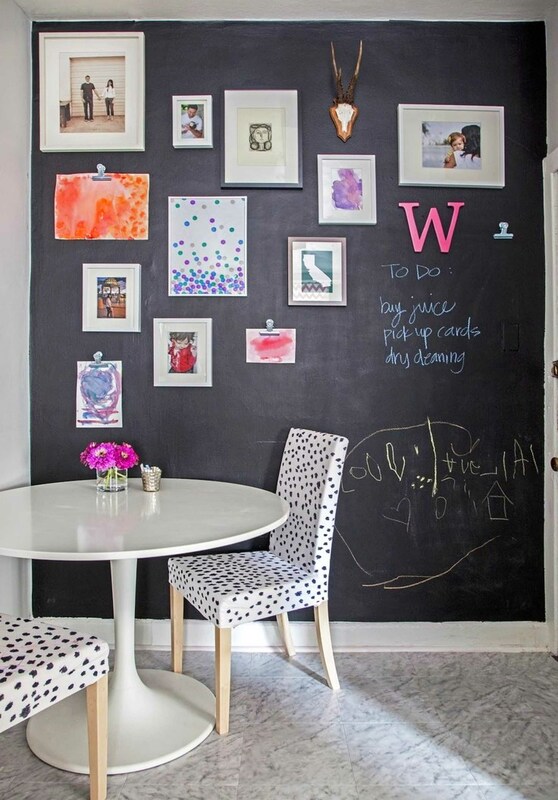 If you have a kid or two at the age of having fun with wall scribbling and doodling, then applying chalkboard kind of accent wall could be win-win solution for you and your little artists. You can have the wall works double as gallery of art as well and make it becomes a meeting point of informality and formality. The upside of this chalkboard type is you can get creative and make use of it however you want. For example, to display family portraits, showcase your children’s masterpieces, to be a notice board, etc. It is easy to clean, too. Pour masculinity in your boy’s room by installing some stained and sealed knotty pine boards on the headboard accent wall. The installation process is pretty easy and you highly likely can do it yourself. Give some distance between each plank to create the effect of peek-a-boo paint. It will have the form of 3-D stripes. One of the ways to transform your ordinary bookshelves into something extraordinary is by painting out the back wall of it. 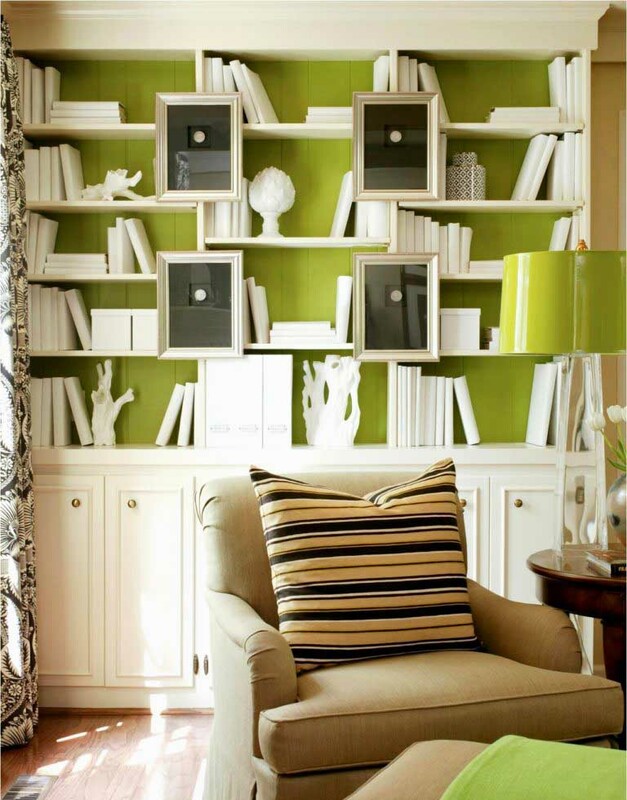 By doing so, you have the shelves serve also as an accent wall. It’s inspirational, easy to do, and clever. Choose a paint color in the same shade with the room’s element. It’s lime green for this room’s case. You can treat the wall only and leave the shelves as they originally are or you can utilize a few monochromatic pieces onto the shelves. You can pick one of the two options however you see fit to emphasize the accent wall. An accent wall in baby’s room is mostly where the baby crib is. 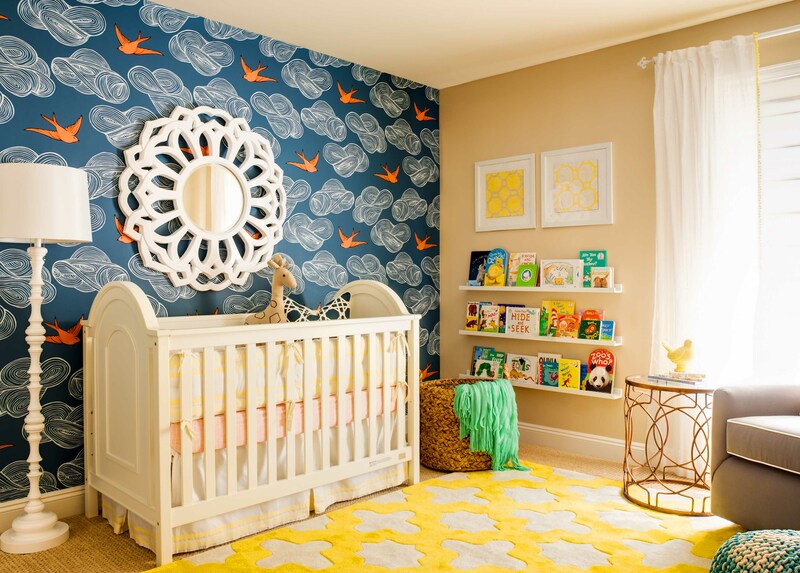 For this nursery room, unusual sparrow wallpaper is used to have some eclectic décor within this adorable space. With dominant blue, this wallpaper has done a great job as an accent wall to the entire room. The downside of this sparrow accent wall is it might be a little bit too crowded and not related to baby thing. The tone also does not quite match with the mat on the floor. Yup, modernity is on the call. The black paneled accent wall looks glamorous and so not outdated thanks to the LED lights which lined interestingly. 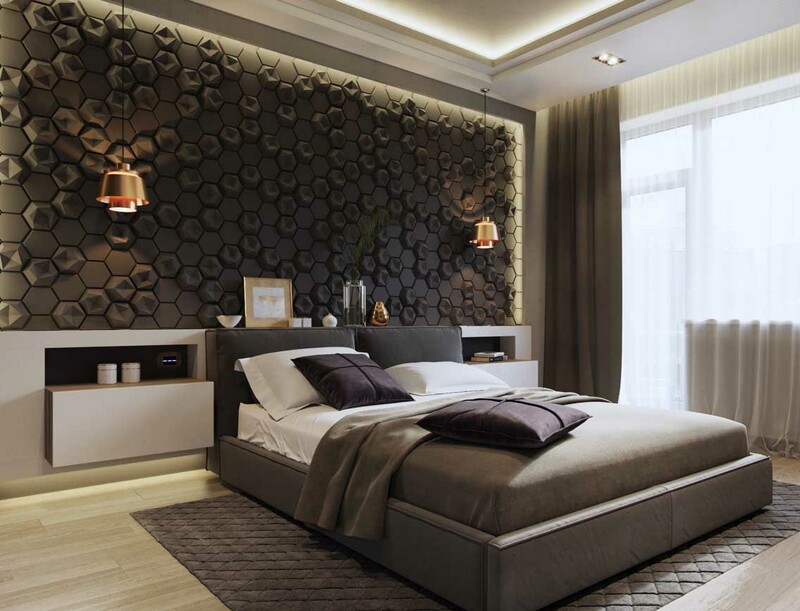 However, because it’s black and thus gives the effect of darkness, the application of such panel on the accent wall only suitable for a large master bedroom’s with also large windows like this one. The upside of this LED thing is apart from its function to emphasize the accent wall, it can also be the part of lighting arrangement. So, you hit two birds with one stone by applying this one. This hexagonal beehive accent wall design might not attract bees to come, but it surely is inviting and eye-catching. Such dark grey beehive has textured as it is designed with some panels that pops in and out. Not to mention the lighting arrangements of two pendants on either side of the bed as added values. 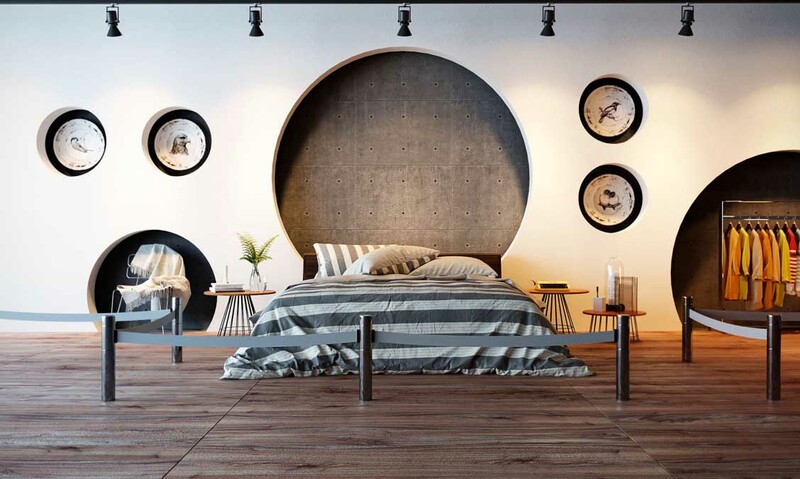 Have some unique bedroom headboard as an accent wall with grooved wood installation, for example. The bedroom seen in the image gives you an example. It adds absolute difference and creates the look of light and breezy. Apparently, the grooved wooden accent wall goes all the way to the bathroom next to the bedroom, also. It is needed to emphasize consistency. 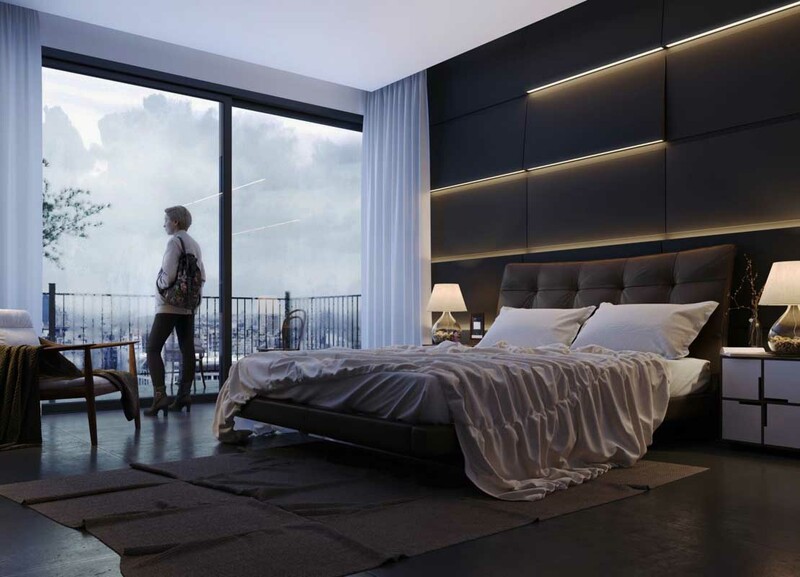 If not for the concrete lamp, people might already think that the glass door is a mirror showing the bedroom reflection. Your last accent wall idea is this decorative one. Which one is the accent wall if this is the case? Yep, you’re looking at it, pals. The entire space from the very left edge all the way to the very right end is the accent wall. The bedroom owner has it designed in circular special enclaves, seven circles to be exact. Four of them to display traditional porcelain plates, one for scarf-laden chair, one to be the bed headboard, and the last one for the open wardrobe. But what interestingly funny is the bed bordering that often seen in queues. An accent wall doesn’t have to be different with the other walls in the room. It may take the exact same color and form as well. 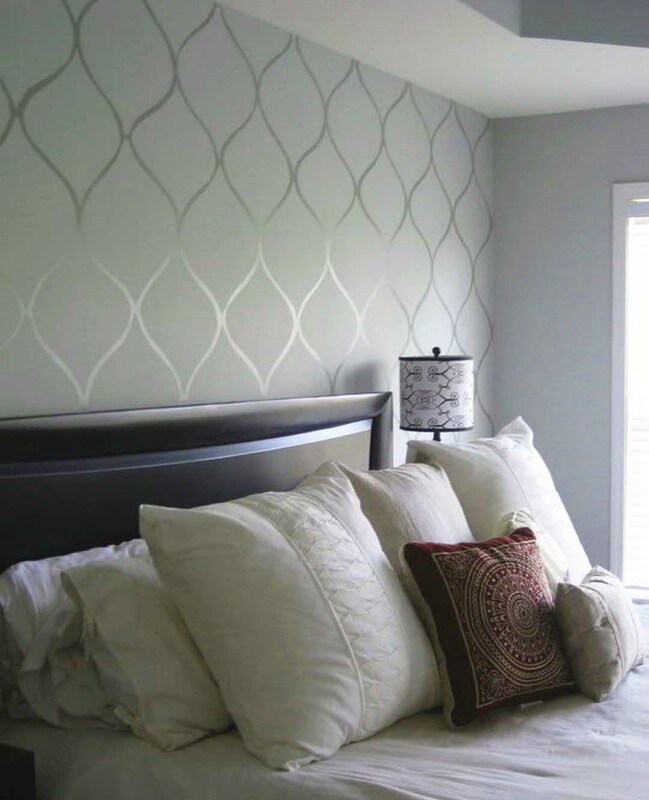 It is the kind of treatment that you apply to that specific wall, so it catches attention. For the matter, 15 accent wall ideas above are presented in the hope to be of any help in finding what you really want to do with yours. Thank you for reading and have fun executing your accent wall!